"The shades of García Márquez and Frida Kahlo will be getting down to the light-driven, sound-source experience that is the Mayan Warrior." Much of the nightlife for the nearly 70,000 attendees of the upcoming Burning Man 2018 is inspired by DJ sound systems in portable venues, resulting in open-air raves raging into the morning hours amid Nevada's Black Rock Desert. These music events can be found in temporary structures and tents, on bicycles and even aboard a jet plane; a 747 jetliner will serve this year as a "moving art experience." One of the festival's most memorable attractions has a fascinating provenance; it all started when one of Mexico's young tech entrepreneurs brought together a collective of south-of-the-border artists and created the Mayan Warrior. This year, the Warrior's seventh, brings new, Mexican Huichol art and for the first time, a tour around the United States, with stops in New York, Los Angeles and San Francisco for fundraisers that will benefit the arts nonprofit Create Now, which provides art programs to at-risk youth. Pablo Gonzalez Vargas, 40, who created the Latin American electronic payment system Sr. Pago, orchestrated the creation of the Warrior. "I’m a big fan of the Mayan culture," he said. "It’s grabbing those two elements, ancient art and modern technology, and putting them on this platform," said Gonzalez Vargas. The basis for the art car is a heavy duty International 4400 truck that's been torn down and rebuilt with blazing neon, laser lights, a DJ booth and loudspeakers. The truck's cab now has been transformed into the head of a supernatural Mayan being. 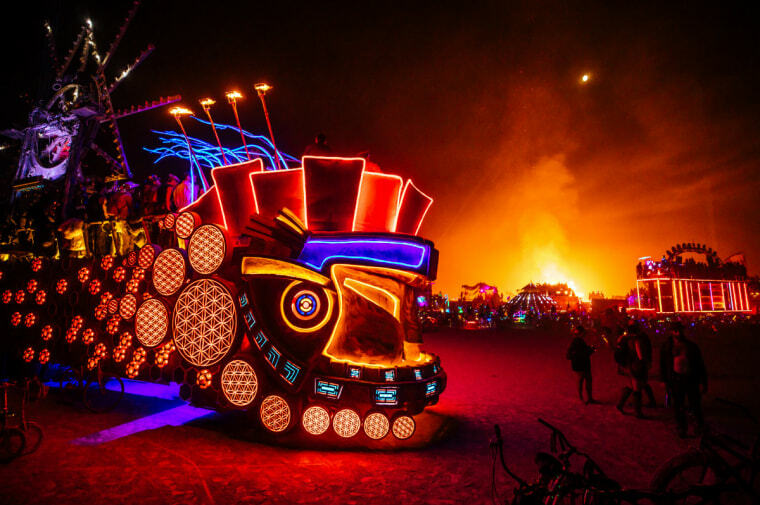 Art cars are a top attraction at Burning Man (Aug. 25-Sept. 3) according to Playa veteran and UC Davis business Professor Emerita Nicole Woolsey Biggart. "They’re known as mutant vehicles because they have to be mutated," she said. "You can’t just take a Volkswagen bus and put daises on it and call it an art car. These art cars are absolutely fantastic. They’re large, they light up, have smoke machines, music, bars, dancing platforms. It's hard to even imagine." "It's a really amazing art car," said Athena Demos, who for years was the official Burning Man regional representative in Los Angeles. "Mayan Warrior is one of many with big sound systems and big-name DJs." Burning Man forbids collectives from revealing DJ lineups — event leaders don't want it to turn into Coachella — but Mayan Warrior has built a reputation as a must-see sound system that, in years past, has hosted big font dance music artists, including the well-regarded spinner Dixon in 2017. Mayan Warrior's hosts are allowed to say that Paolo Montiel, a designer best known for setting the Chichén Itzá pyramids aglow, is the man behind much of the art car's club-style lighting. Mark Nath, who has produced laser shows for top hip-hop, pop and EDM acts (Jay-Z, Lady Gaga, Tiesto), will do the same for the Warrior. Colorful, geometric bracelets constructed by Huichol people are coming along for the ride, too. "Each bracelet is handmade and it takes one day to make," Vargas says. "They’re very beautiful." Organizers of the sound system said in a statement that their effort is ultimately about "sacred and ancient sources of geometry." William A. Nericcio, a San Diego State University English scholar who has written about Mexican influences in American pop culture, seems to agree. "One part Moebius, one part Carlos Castaneda, one part low-rider, one part Vegas, one part Studio 54, this automobilic melange of sights, sounds, and hubcaps (and DJs!) is the ultimate example of Latin American syncretism -- the tribal communal spirit of la gente, inflecting the experience of raves and reinvesting it with something unique," he said via email. "While the ghost of Henry Ford would not approve, the shades of García Márquez and Frida Kahlo will be getting down to the light-driven, sound-source experience that is the Mayan Warrior." Indeed the platform connects the ancient psychedelic mysticism of Mexico, a birthplace for rituals involving magic mushrooms and peyote, with the cyber-hippy technology of today's Burning Man. "This is not necessarily to expose people to Mexico's psychedelic history," Vargas says, "but for sure it's inspired by it."